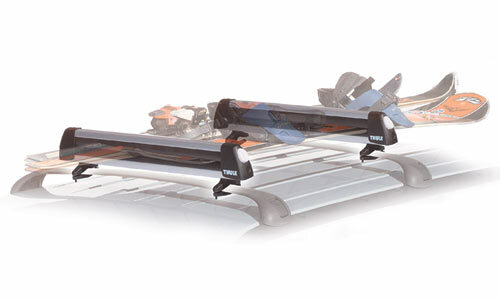 Quality construction and great looks for up to 6 pairs of skis or 4 snowboard transport. Universal Mounting Hardware and Locks are included out of the box! Safely carries between 4/6 pairs of skis or 2/4 snowboards. Easy to open while wearing gloves with oversized push button release. All ski carriers must be closed and locked during transport. Will accomodate Alpine and Nordic skis, skis in ski bag, mono skis, snowboards and water skis. These carriers are compatible with most factory racks. Please see Fit Guide for more information. Extruded aluminum with clear anodized coating. Zytel lock and hinge housing. Hardware is zinc iron plated steel.